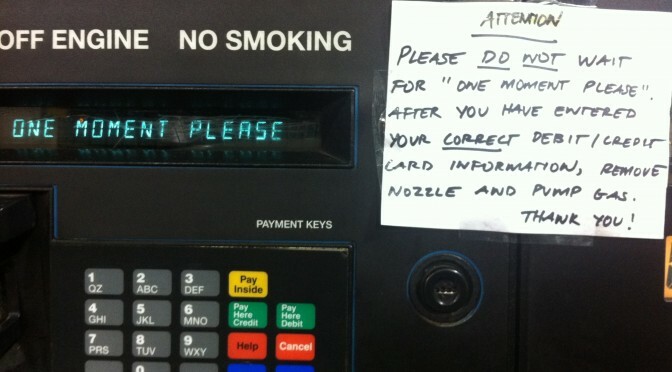 A curious addendum to account for a UI/UX muck up at a nearby gasoline station. These moments reveal these hybrid displays — both purposeful, and one made to accomodate for failures in the machine. And this second one — how peculiar. My new laser printer to replace the 10 year old one what that I printed my dissertation on back in 2004..it’s fine. A bit noisy. And it’s got a whole slew of LEDs to indicate status and all that. The one it replaced? It had a light that was either green (“all good”) or flashed amber (“something’s wrong..paper jam!”) In the last days of the old printer’s life — that light just stayed amber and never went back green. This new one? Well — it’s got lights for days and a sticker it came with so you can figure out what all the flashing codes mean. Why do I blog this? Just trying to understand the complexities and vagaries of the interfaces to our devices. This complex of things that we need to know about when/where/how to operate them — how long to wait before doing something (slow machines? slow networks? ), how to know what’s going on with the machine and the obscure ways they want to talk to us..flashing lights.